Reviews & IME's Summer Sale! We're over halfway through the year so why not get a discount?! If you purchase a print copy of the Reviews & IME's book directly from me via the 15% off Summer Sale link below you'll get the book for over 15% off (not $99.95 but $84.95- a savings of $15). You'll also get FREE shipping. In addition I will send you a current 2018 copy of the Excel spreadsheet with the list of referral source companies and their websites AND a copy of THE NEW 2019 EXCEL SPREADSHEET when that is ready this coming Thanksgiving. Remember to use the link below for the Summer sale via PayPal- this offer isn't valid if you purchase the book on Amazon. Open up this directory of hundreds of companies that refer medical records review and independent examination work to healthcare professionals. Health care professionals: Do you want more independence with great ways to supplement your income? Do you want opportunities to work from home? The directory in this book is loaded with perfect opportunities for you with specific information for each company. The peer review and IME opportunities include medical consulting on cases related to private disability insurance claims, Social Security disability claims, Veterans' and other disability programs, workers' compensation, personal injury claims, malpractice, quality assurance, standard of care reviews, health care utilization review, medical necessity and pre-authorization to only name some. The book offers an introduction to getting referrals for the many different opportunities in file review and independent medical examinations. It provides profiles and contact information for hundreds of organizations you can work with. This is one of those rare books which will more than pay for itself. Save yourself months of research trying to find these opportunities. This book is first and foremost an opportunity directory. 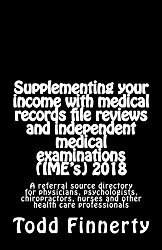 Open up your little black book for success in reviews & IME's and start getting referrals for medical records reviews and/or independent medical examinations now. If you order the print copy of the book directly from Dr. Finnerty via PayPal on this website Dr. Finnerty will ship the book to you for free and also email you a copy of an Excel spreadsheet with the names and website links of each of the hundreds of companies in the referral source directory. To save a little money you can also simply just buy the referral source list spreadsheet and not the book.